We first came across the band Chorusgirl back in the middle of last summer, fittingly they were the opening act on a bill of emerging London-acts, headed by Flowers, who would later go on to become their label mates. Back then they felt raw and exciting, a band with a lot of interesting ideas, but one who were still shaping their sound and working out what they were going to be. Fast forward a year to this years Indietracks, Chorusgirl were opening proceedings on the Indoor Stage, and it was obvious just by looking at them how much their confidence has grown, their sound had become more intricate and more their own. They suddenly seemed like a band who were ready to take on the world. This month they’re set to release their self-titled debut album on Indie-Pop mecca, Fortuna Pop. It’s an album that takes what they do so well live, the hook-laden guitar lines, the insouciant and gently accented vocal delivery, the thrilling pounding drums, and subtly lifts the bar still-further. It’s a denser and darker place than you’d imagined, from the lyrics that hint at a quiet dissatisfaction, of loneliness, loss and anxiety; to the production which fleshes the songs out from their melodic poppy beginnings into something richer and more rewarding. Having crafted one of the most intriguing and rewarding debut albums of the year, we were lucky enough to sit down with singer Silvi Wersing, the original Chorusgirl herself, and discuss inspiration,songwriting, the state of the music scene and much more besides. FTR: Who are/is Chorusgirl, and where do you come from? I started Chorusgirl as my recording project at the end of 2012, and formed the live band in early 2014. Now we’re a pan-European noise pop 4-piece; our bassist Udo and I are German, our guitarist Diogo is Portuguese, and our drummer is half Irish/British. I decided to name the project/band like that because I saw myself as a ‘chorus girl’ moving to the front. It was a huge step for me to start writing songs and even more so to start up my own band. In my very first band, I played lead guitar but after that I played bass for years in other people’s bands because I thought I wasn’t enough of a legit guitarist. I was more happy to be in the background and I didn’t think I’d be good enough to lead a band either. However, I was always the most determined in all bands I was in, and that bloody-minded determination just won through in the end. After my last band fizzled out, I decided to strike out on my own. FTR: Did Chorusgirl start out as a solo project, how much of the writing is solo and how much is done as a band? Yes, it started out as a solo project and remained so for a while. I got the live band together once I had enough songs and once I thought that the songs could be performed. I would have probably started earlier with the live band, but I also had to help look after my parents for a while. Most of the writing is still solo. I write the songs, and will spend some significant time to make my demos sound as good as I can, hacking away at them and crafting them. I then try and work out the songs with the band and get their ideas in, and that often informs how we record them in the studio. So while I write the songs, the band contribute some parts now. However, a not so small chunk of this album was recorded before there even was a live band, with me playing most of the instruments except the drums. So it’ll be interesting to see how the process will be with the next one. FTR: Your debut album, Chorusgirl, is out this month on Fortuna Pop. Tell us about the recording process? Was it self-produced? It was co-produced together with Jan-Niklas Jansen at Bear Cave Studio in Cologne and recorded over the course of 2012-2015. Niklas is a long-time friend from German indie band Locas in Love, who own the studio. He is wonderful to work with. Very imaginative, enthusiastic and knows and understands a lot of music. In the studio it is important to work with someone who intuitively understands what you’re aiming for. They help you pull the music out of your head into the real world. It’s just great not to have to use a lot of words when trying to explain a sound I’m going for. For example, when I tell Niklas I’d like the snare to sound like Disintegration era the Cure, then he immediately knows what I mean. Niklas was also very comfortable to start working with my pre-produced demo tracks. He didn’t laugh me out of the room when I gave him shoddily recorded guitar tracks. I can’t recommend working with him highly enough. People should go check out working with him. FTR: How did you come to work with Fortuna Pop? What was it about the label that appealed to you? I’ve been a fan of Fortuna Pop for a long time. It’s a UK pop label that has a great identity and that has a lot of very special bands on its roster, Flowers, the Spook School, Tigercats, Joanna Gruesome, Allo Darlin, Martha. All of these bands are very unique but have an accessible sound. FTR: Do you think labels are still important now, did you consider self-releasing the album? I didn’t really consider self-releasing because I knew I wouldn’t be able to push the album far out enough into the world without help. Labels are still vital. From a listener’s perspective, you know that you get really interesting alternative pop with a label like Fortuna Pop. From the band perspective, it is important because you are part of something bigger. It’s not just the four people in the band anymore; you have further people on your side. To have someone that believes enough in you to spend their time and money on you, that can give everyone a huge lift. I’m proud of the album and I would like as many people to hear it as possible. It is possible to have a career as a DIY musician, but it’s a tough career choice, much harder than an office job because you put so much more of yourself on the line. Because it is an art form that allows an introvert like me to focus on and create work so I can connect with people. I feel pretty misunderstood in a lot of the rest of my life. Music can create whole universes for our dreams. It was vitally important to me growing up, maybe even lifesaving, and I was thrilled when I started to understand how music works well enough in order to be able to make it myself and become an active person rather than a passive listener. FTR: Who are your influences? Did you listen to anyone in particular while you were making this record? I constantly seek out inspirations. The record was made over a long time so there were a number of bands. Two bands that were really important at the start though were the Vivian Girls and the Dum Dum Girls. I feel there are two important types of artist, the ones that just create great music you can fall into, like David Bowie, Fleetwood Mac or Kate Bush. To me that is very complex music that I like but it feels oddly remote because I’m not a trained musician. And then on the other side, you have bands whose sound is very accessible and simple. A band where you truly feel ‘this song is great, and I could have also done that myself’. And these latter bands are tremendously important. Nirvana and the Pixies fall into that. Bands that make you pick up an instrument and have a go yourself. For this project, the Vivian Girls and the Dum Dum Girls showed me that I can make guitar music; they gave me permission if you will. Once I’d started, I then looked to Kim Deal’s work and to older bands like Lush, the Cure and Echo & the Bunnymen to get more into the sound that I like. FTR: Do you think being in London helps or hinders being a musician? It’s one of the best places to be a musician. The scene is big and there are many many places to play. There are also videographers, writers, illustrators and a lot of other creative people here. Rehearsal spaces are ridiculously expensive though. FTR: Which is more important to you, making records or playing live? Do you enjoy both? I enjoy both, but making records is king. It’s how I grew up, just listening to endless hours of records on my own. Typical introvert. And there’s nothing I love more than putting down ideas for a song. Then as a secondary thought I work out how to play that live. FTR: What can someone expect if they haven’t seen you live before? A tight and loud rock show. FTR: You’ve got Wolf Girl and JUNK playing with you at your album launch. Do you feel there’s a good scene in the UK at the minute? What other bands should we be looking out for? The scene is excellent! A lot of the bands that I love from the scene have been featured on your blog. It’s an excellent source for interesting UK bands. I’m psyched about the upcoming album on Oddbox from Wolf Girl. The first single is tres cool and catchy. I’ve just made myself a long playlist with ‘colleagues’ from the scene, like Trust Fund, Two White Cranes, Night Flowers, Flowers, Tigercats, Witching Waves, Gloss Rejection, Fake Laugh. New bands I would say Charla Fantasma and Flemmings, both super tight live now. I hope they record more in the near future. In terms of pop, I’d keep a close eye on FVC, who is very talented and writes in the vein of the best material that the Long Blondes have made. FTR: Where does the inspiration for your lyrics come from? Do you think it’s important what a band has to say, or are you keener for the music to tell its own story? The music is the most important thing for me, and the lyrics are secondary. Like everyone, I find it easier to listen to a great song with terrible lyrics than the other way round. I think the best lyrics are those that leave enough room for your own interpretation. So it’s important to code them well enough so that listeners can put their own meaning into the lines. I tend to write in images and am not concise in my writing, so this lends itself to preserving some vagueness anyway. This doesn’t mean that the lines are interchangeable in their meaning though. In a song like No Moon, I could explain every single line if someone wanted to know. FTR: Do you feel as a woman in a band that you are expected to represent female musicians? Do you think your gender has affected the chances you get in the music industry? I don’t feel people have specific gender-based expectations towards me. Weirdly enough, my gender hasn’t come into it at all so far. I feel like I’m only starting out properly now though, so maybe ask me again in a year. Nah, we’re not very image conscious, probably not enough. I generally prefer going for authenticity, and I’m an outwardly very friendly person with a pretty dark and intense streak that I try to hide as best as possible. It’s actually quite strange for me to see how that has found its own way into our music. There are a lot of happy melodies but the lyrics are intense. Some reviews have pointed that out, and I was surprised to see how well that does not only sum up the album but also my personality. Two home truths here: you can’t hide from yourself in your art and reviews are powerful. FTR: How do you feel about Streaming services like Spotify. Do you think they’re a good think for the independent music scene? I don’t usually use Spotify. I buy all the music I listen to. I feel ambivalent about streaming. I know how expensive it is to be in a band, so I try and support every artist whose music I like by buying it. Streaming makes sense in terms of giving a band more exposure via availability, but you’ve only got ask people like Trev from Oddbox Records to understand that streaming does nothing to sustain grassroots level record labels. And those record labels are vital for bands when they start out. These labels build scenes and communities. Trev’s sales went down after everyone started using spotify. FTR: What do you think the future is for guitar music? Would you consider incorporating other elements into the band in the future, or is the current line-up a key part of the sound? In general, I think guitar music will always exist, and will always have its comebacks. The guitar is such a good live instrument. People will re-discover it again and again. Regarding my music, there is actually a good number of synths/organs on the album. But for the live band I decided to go for the simpler guitar band set-up. The guitar band has the most romance to it, and it’s a simple and direct set-up on stage. I’ve been in bands with synths and we used backing tracks for the live setting, but unless you play in big clubs, synths or backing tracks may end up sounding a bit thin. I think an immediate, loud and direct live experience is best. But I wouldn’t rule out instrument/sound changes at a later stage. FTR: You put together a choir of defectors for your Indietracks set, would you consider other collaborations? Is there anyone in particular you’d like to work with? Yes, in that choir were a lot of women I would love to collaborate with! Mostly, it is question of time, but I’m sure after the debut has come out and we’ve promoted it for a while, I’ll be able to finally ask the people I have in mind to do something together. This is something I’d really love to do next year. FTR: What are your plans for the future? Touring, more singles, the next record? We’re aiming to play a lot of gigs in the next 9 months to promote the album. We will be doing a UK tour in Nov/Dec, then another one in February, and we’ll be touring Germany in Mar/Apr. There will be more singles and more videos. We’ve just finished filming a bunch. Then work on the next album will start next year, but we’ll see. I’m a big proponent of quality over quantity (which is maybe becoming an old-fashioned way of creating music). I’m not really an artist that writes fast and records an album in a week. So we’ll see. Funnily enough, I can’t wait to start writing songs again though, because I’ve been dealing with a lot of tour booking and emailing in the last few months. Chorusgirl is out November 13th via Fortuna Pop. 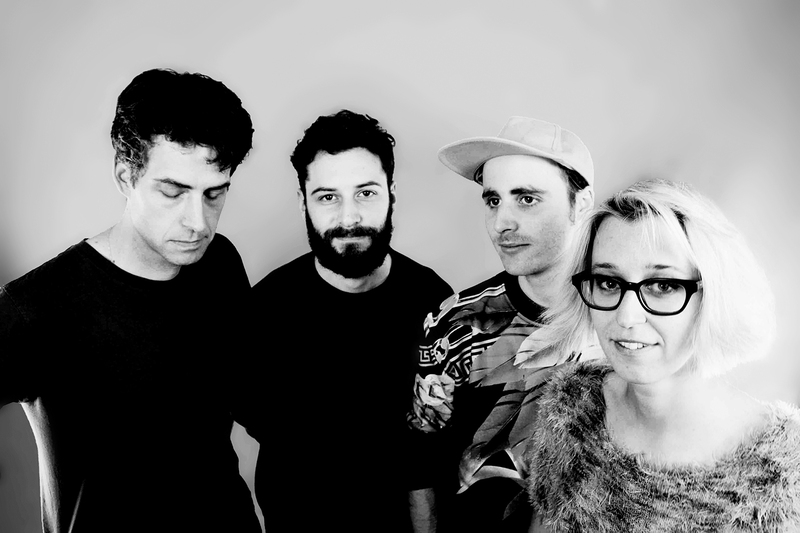 Chorusgirl tour the UK in November/December, click HERE for more details.